Congratulations to Teri Polen on her latest book release! Today is the release date for the print edition of The Gemini Connection! I’ve spent so much time with these characters over the past year plus, and they’re ready to send out into the world – kind of like shoving your kids out of the nest. I hope you love them as much as I do. For those readers who prefer the ebook, it will be released one week from today on June 7th. 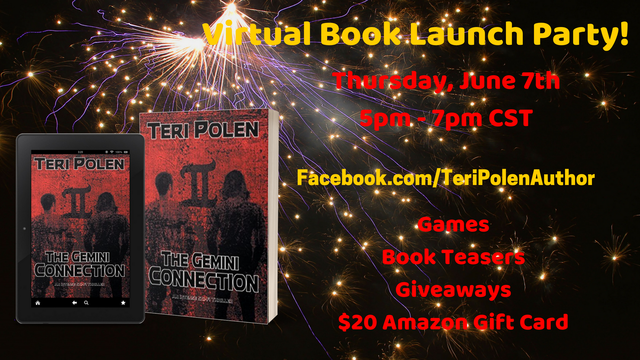 To celebrate that release, you’re all invited to the Virtual Book Launch Party at Facebook.com/TeriPolenAuthor next Thursday – hope to see you there! Thanks so much for reblogging!